Hubs and I took a day trip out wandering around following the GPS prompts to end up at a sunflower field in Maryland last month. There were rows and rows of the flowers; and lots of flying bugs. Fortunately, the bees were only interested in the flowers and not the humans. I've always had a fondness for sunflowers, so I thought I would make a series of sunflower cards. The flowers were cut using Simon Says Stamp Radient Sunflower die. Sentiment from Hero arts, I also used a brick stencil and embossing folder from Sizzix. Impossible to see here, the petals are coated in yellow WOS. A bit of free hand water coloring. 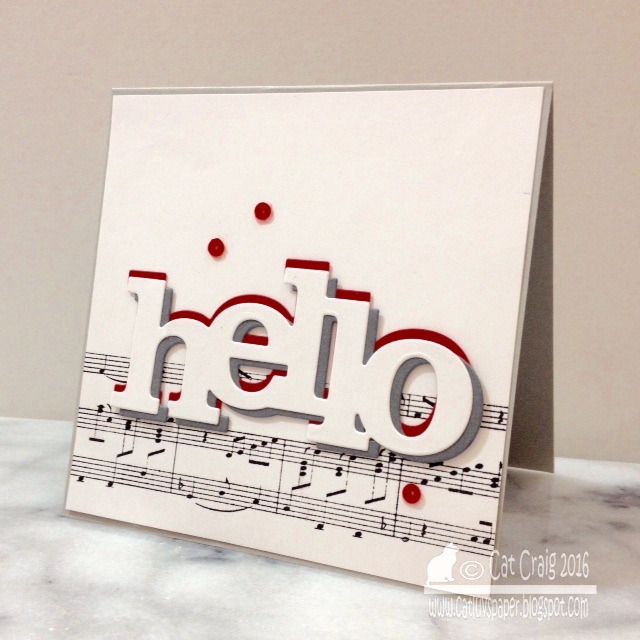 And lastly, a simple panel die-cut from my sweet friend Barb, that was simply mounted on a yellow card base. A simple card with heartfelt thanks for our Mom and Dad hosting us in Ohio the last week. That beautiful Concord and 9th butterfly die cut was sent to me by the sweet and lovely Barb of Barb's Studio Creations. I colored the wings and body with Spectrum sparkle pens. 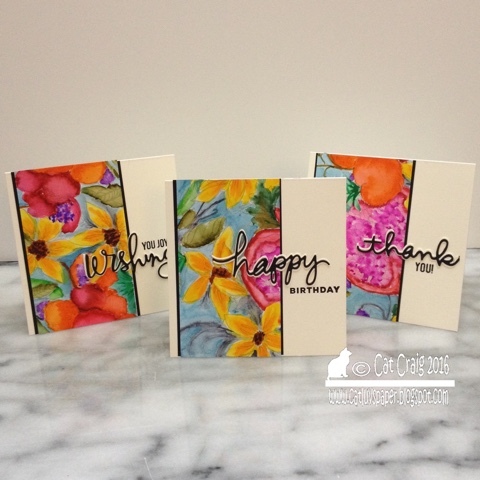 The paint stroke is from Hero Arts Brustrokes stamps, it is heat embossed with white and adds a nice texture. The sentiment is from CTMH Sending Love. Hi a quick post, this man card is for my Dear FIL, whom we are vising for his birthday. 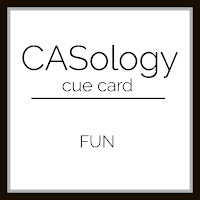 I was so pleased that my dizzy dog card won over at Casology, last week. Thank you so much, Judy, for picking my card. 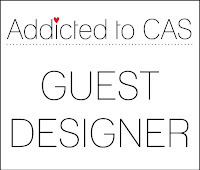 So then, I get an email from Melissa asking if I would like to Guest Design...well YES of course. So I am thrilled to be able to do this again. Thank you so much for the invitation. My CAS designed card uses a neutral background that isn't white with pops of color tied to the sentiment. There is texture on the card but not a lot of clutter. Thanks so much for stopping by, now go play with the cue word! I'd love to see your creations in the gallery. This watercolor paper die-cut grouping of birds from Concord and 9th was sent to me by my sweet friend Barb. I have been watching a lot of the Olympics and haven't created in quite a while, so I needed to get my feet wet with something easy. A few zig watercolor pens, an arch shape from a pile of die cuts that didn't work out and a fun embossing folder all came together for this card. It'll be sent to my Dad, along with a few puzzles. The cue word at Casology this week is Dizzy. It took me a while to think of a card, but once that first spark came...it took all of 30 minutes. I am definitely a cat person, but how in the world could a person not fall in love with these adorable dogs? To me, he looks like he's been chasing his tail for a bit and is very dizzy! 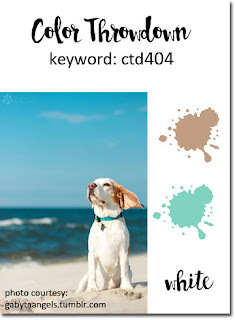 Two stamps, Magical Background and Crazy Dogs worked perfectly together along with Crazy Talk to put together this dizzy card! Simons Fog in provided the dotted circles, and Copics in the warm grays were used for coloring the pup. 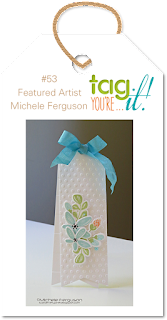 At the Tag You're It Challenge #53, Michele has put up a sweet floral bookmark for our inspiration. I had a piece of watercolored paper in my scrap bin, and I loved the colors. I used WPlus9's Bountiful Blooms die and started building my bouquet. My scrap had no green in it so, I cut a white piece and colored it with a spectrum noir sparkle pen. The embossing folder is SU's new Petal Burst. My first cardmaking stamps all came from Hero Arts, and the Delicate Blossom set will always be a favorite. I have embossed and watercolored it, just stamped it and lately I am loving it as a no line (or vary faint line) coloring project. The set has two images; I color and use the larger open flowers most, see this example. Two challenges provided the inspiration for this card, Simon Says Stamp - Wednesday Challenge Fabulous Florals (using HA products) and Case this Sketch...I did take a might bit of a liberty with the sketch. My supplies include :1 Die (Hello from W&W) and 1 Background Stamp judiciously masked and stamped (MFT's Sheet Music), 3 Red PPP sequins in the 4mm size, and some card stock. This card evolved, first I had just the white die, and it was well meh. Next, I added the dark gray layer as a shadow to the hello, a bit better than meh but not much. Then I knew it needed a pop of red, and voila I love the card as much as Adele's song. It goes to show, an initial design idea can need some tweaking to match the impact the design had while you were formulating it in your mind. I made a second card as well. The challenge runs two weeks, give it a try! 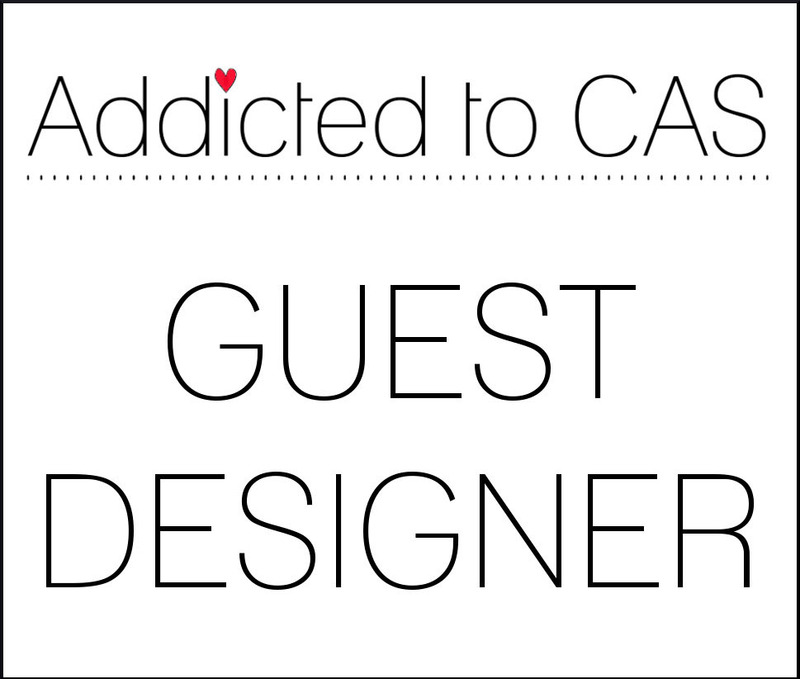 My heartfelt thanks to Barb at Addicted to CAS for the invitation to guest design! What a fabulous summer palette at Color Throwdown #404. Thanks so much for stopping by. Now I need to go back to bed! Today is/was National Coloring book Day. I grabbed my zig markers as well as a page from the Painterly Days Flower Watercoloring book and took them along to my crafty Tuesday group. This was my first time trying a coloring book. Most I have seen have such small images it is tough on my aging eyes. This book, though has larger images. Here is the 1/4 page I water colored. Here is the card that resulted from my favorite portion of that quarter page. I added Sending and Hugs from Simon Says Stamp's Sending die, and Sending and Wishing stamp set. I stacked the black die onto two cream colored dies offset in both directions to make sure that die stood out against the painted background. I am submitting this card to two challenges - Anything goes at the Simon Says Stamp Flickr Group. It's their 50th challenge. The second challenge is Casology Week 209- Watercolor. I am not sure there is quite enough "white" space, but this is a simple card. Hurrying to get another card done for a couple of challenges. 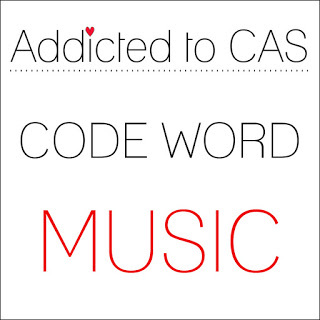 It is all about CAS. The card is inspired by the sketch at Case this Sketch # 178, and it plays well for Addicted to Stamps and More - CAS #204. My supplies were simple, Die from WPLUS9, Hero Arts Inks in three blue shades, Brushstroke and Sentiment stamps from Hero Arts as well. A couple of Copic markers provided that warm yellow for the sun. I am playing with Paper Smooche's Chubby Chum Pals stamp set. Specifically the crab. He is adorable. Maryland is famous for its Blue crabs. Best. Crab. Cakes. Ever...though the San Francisco Dungeness crab cakes are mighty fine too. We even have a local baseball team named for the Blue Crab. The supporting supplies are the Maryland stamp set from CTMH, a greetings stamp set also from CTMH, a stampendous newsprint background stamp, a pretty pink posh die and some googly eyes. 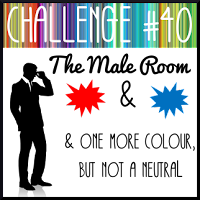 The challenge at The Male Room is to make a masculine card with Red, Blue and one other color that is not a neutral. I chose yellow naturally (I love yellow). So, I spent more time hunting for the googly eyes and a stamp that simply said "Greetings" than putting together this card. None of my season's greetings stamps have a smaller font! I think that word should be added to many stamp sets that are a collection of single words! If ya know any stamp designers...pass it on!